It carries a lot of baggage from the old ways of doing things- from pontificating by PowerPoint to trying to squeeze a handful of personalities into a one-size-fits-all corporate event experience. Today most of what we do is ranked specifically on the “wow” factor scale. Everyone wants buzz-worthy stories to tell their friends, and every time we go to an event, the first thing we wonder is, “Will this be exciting enough to talk about later?” Let’s face it, your traditional conference meeting isn’t going to give them that. Everything around us is constantly changing, and that includes your event style. Non-traditional events are huge right now, and no one wants to be last on a trend bandwagon. So, here are some great ways to stay ahead of the curve and get your attendees excited. Everyone knows that pre-event engagement is an important step in the process, but who says the event has to start at the conference center? Let attendees start the fun and potential networking early by creating fun, pre-event meetups. This could take the form of simple cocktail party or town hall gathering at various locations for your employees. Use the event to pitch the importance of attending the conference. A pre-event meetup is also a great time to introduce a teaser video and ensure it connects with your employees. If you can’t get everyone together before the event, use digital tools to get your people excited. Fire off interesting content on your mobile event app. Also, you can offer exclusive content for registered attendees before the event – for example, a live, two-way interactive videocast with a relevant thought leader or celebrity expert. When taking the time to go to an event, attendees want to be wowed with a completely unique experience. It doesn’t just mean the sessions and activities, the location itself is included in the mix. According to Global Hoteliers, in 2017, the demand for nontraditional meeting and event facilities will increase by 3.8%. To give every offsite experience or session an edge, you can leverage organizations like Peerspace to find non-traditional event spaces near your convention center. This tool can help your event feel more like an exciting activity, and not just another string of meetings in a giant conference hall. While your event may be too big to avoid the conference center, you can still keep the trend alive by creating off-site sessions that take advantage of what the city has to offer. Some great examples would be to utilize lofts, rooftops, art galleries, or vineyards. Incorporating what is unique to the city is a great tactic as well. The 2017 PCMA Education Conference was a success story for how to execute this conference style and turn attendees into participants. The seating format can be the worst part of conferences. Quantity often replaces quality, which makes everyone feel crammed into the space. Introducing more comfortable, functional seating can be a way to keep everyone happy… and learning. Companies like Steelcase specialize in transforming the design of your event through interesting seating options. Their belief is that seating style can greatly increase creativity, and thus increase productivity. Steelcase found that 72% of workers believe their future success depends on their ability to be creative. In order to keep your attendees active and engaged, it’s important not to skip over the careful decision of seating options. Think of your event’s breakout sessions – is your seating conducive to learning? Do your attendees agree? No one is going to want to learn if they feel trapped in an awkward and uncomfortable seat. Just because you give attendees comfortable seating, it doesn’t mean they want to stay in them the whole time. Health and wellness should always play a role in your event itineray, and games are excellent for making exercise fun. Take advantage of the instinctive drive for competition we all have by implementing a walking challenge or a 5K race. Even throw in a morning yoga session or city walk to start everyone’s day on the right foot. Games or tournaments are the perfect, casual way for attendees to network. Whether they are physical games like a bags tournament, or digital games like quizzes or virtual reality experiences, it will draw out attendees and connect them with their peers. CPG designed a non-traditional experience for Carnival Corporation with their Amazing Race-style group activity. The game was created to achieve our client’s goal to develop trust and communication and change their employee mindsets about working together. The focus of your conference might be to educate or bring your employees together but don’t forget to let them have some fun along the way. CPG took Carnival Corporation’s keynote speakers to a whole new level at their inaugural conference. Many of the speakers incorporated interactivity into their speeches to keep the audience involved throughout. They would all have activities to perform at the table that pertained to the objectives so the attendees could be entertained and educated at the same time. Entertainment doesn’t have to be limited to the stage though. During a cocktail party or standing event, have entertainers walk through the crowd playing a character to add some comedy. Add jugglers, stilt walkers, or magicians to really wow the crowd. Each time your people come together, it’s another opportunity to provoke different thinking and drive engagement. No one wants to host a forgettable event because ROI will sink along with attendance. Engagement and participation are major factors when it comes to the success of an event. So, don’t just sit there and let your attendees get bored – show them how exciting a conference can really be. Implement these 5 immersive engagement tactics to promote creative collisions and combat disengagement. 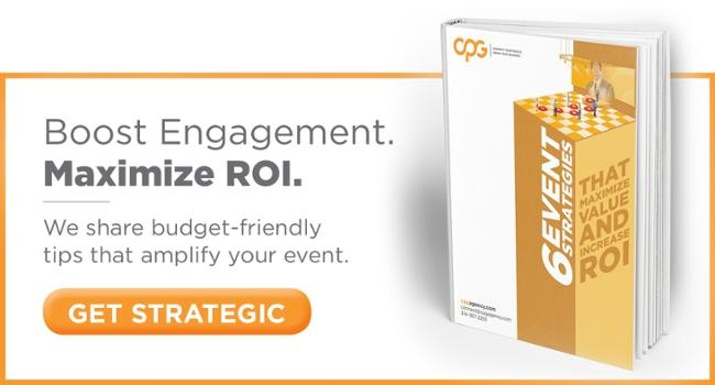 For more tips on how to amplify your next event, check out our eBook and learn the 6 strategies for maximizing ROI.